Figure 8.3 depicts the shredder-CPOM linkage typical of a small stream in the temperate zone. The series of events culminating in the disappearance of leaf CPOM has already been discussed (Section 7.1), and the critical role that microorganisms play both directly and indirectly in influencing the nutritional quality of this resource is elaborated below. CPOM that becomes available in wetlands and larger rivers following macrophyte dieback enters the decomposer trophic web in a very similar fashion (Polunin 1984). Wood is the coarsest of CPOM; few taxa are able to consume this material and its rate of utilization is very slow (Anderson et al. 1978). 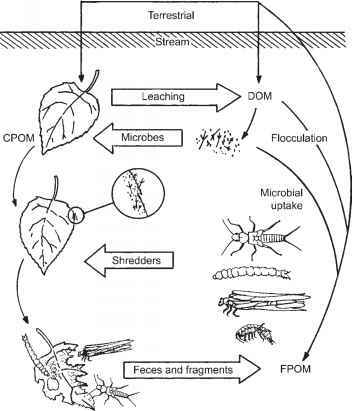 The consumption of autumn-shed leaves in woodland streams by the invertebrates termed shredders is the most extensively investigated trophic pathway involving CPOM (Cummins and Klug 1979), and shall serve as our model here. Invertebrates that feed on decaying leaves include crustaceans (especially amphipods, iso-pods, crayfish, and freshwater shrimp), snails, and several groups of insect larvae. The latter includes crane fly larvae (Tipulidae), and several families of the Trichoptera (Limnephilidae, Lepidostomatidae, Sericostomatidae, and Oeco-nesidae), and Plecoptera (Peltoperlidae, Ptero-narcidae, and Nemouridae). The leaf-shredding activities of insect larvae and gammarid amphi-pods are particularly well studied (Table 8.2). Tipula and many limnephilid caddis larvae eat all parts of the leaf including mesophyll and venation, whereas peltoperlid stonefly nymphs avoid venation and concentrate mainly on mesophyll, cuticle, and epidermal cells (Ward and Woods 1986). The radula of snails and mouth-parts of Gammarus are most effective at scraping softer tissues, and the bigger crustaceans are able to tear and engulf larger leaf fragments (Anderson and Sedell 1979). Low mobility colonized leaves, Gammarus consumed far more of the latter (Kaushik and Hynes 1971). Subsequent work has confirmed that preference is greatest for leaves at the stage of conditioning that roughly corresponds to the period of greatest microbial growth (Arsuffi and Suberkropp 1984, Suberkropp and Arsuffi 1984). The benefits to the consumer include greater efficiency in converting ingested leaf biomass into consumer biomass and a higher individual growth rate. Preference trials that compared shredders from tropical and temperate locations provided with conditioned (leaves submerged in the stream for 2 weeks) and unconditioned leaves from a temperate and a tropical tree found that all shredders preferred conditioned over unconditioned leaves regardless of the region of origin of either the shredders or the leaves (Figure 8.4). In addition, all grew faster when provided with the conditioned leaves (Graca et al. 2001). Considering that the leaves of the temperate tree (alder, Alnus glutinosa) have been shown to be a preferred food in a number of studies, whereas the tropical tree (Hura crepitans, Euphorbiaceae) produces a milky juice used by Amerindians to make poison darts, a general preference for alder leaves is no surprise. More surprising is the observation that Gammarus showed no preference among conditioned leaves, and shredders grown on Alnus and Hura did not differ in survival and growth rates, indicating that leaf conditioning was more important than leaf type. In contrast, a study conducted in Australia found that shredders preferred native Eucalyptus leaves over leaves from sugar cane Saccharum and para grass Urochloa, despite the lower C/N ratios and presumed higher quality of the latter. When supplied only with Eucalyptus leaves, the caddis larva Anisocentropus kirramus showed low consumption and assimilation rates (Clapcott and Bunn 2003). Green and senescent leaves differ in their phenol, lignin, and nutrient content, and thus in their quality as food. Larvae of another caddis, Lepidostoma complicatum, grew more slowly on green than senescent leaves and none reached maturity, whereas 70% of larvae fed senescent leaves reached the adult stage (Kochi and Kagaya 2005). However, larvae that were provided with both senescent and green leaves had a faster growth rate than those provided with senescent leaves only, probably due to the higher nitrogen (N) content of green leaves. The freshwater shrimp Xiphocaris elongate was found to prefer leaves of Dacryodes excelsa over Cecropia schreberiana, despite their higher secondary compound content and firmness, apparently because of the lower lignin content of Dacryodes leaves (Wright and Covich 2005). Microorganisms may enhance the palatability and nutritional quality of leaves in at least two distinct ways (Barlocher 1985). One, termed microbial production, refers to the addition of microbial tissue, substances, or excretions to the substrate. Because assimilation efficiencies on fungal mycelia and mixed microflora have been shown to exceed 60%, while values for conditioned and unconditioned leaves average near 20% (Barlocher 1985, Martin and Kukor 1984), indications are that the nutrient content per unit mass in microorganisms can be several-fold greater than that of the leaf substrate. The second potential role for microorganisms is microbial catalysis, and encompasses all of the changes that render the leaf more digestible. This includes partial digestion of the substrate into subunits that detritivores are capable of assimilating, and production of exoenzymes that remain active after ingestion. As support for this proposition, Barlocher (1985) pointed out that structural carbohydrates (cellulose, hemicellulose, and pectin) may be partially digested by microorganisms into intermediate products which the gut fluids of invertebrates are then able to degrade. Indeed, leaves subjected to partial hydrolysis with hot HCl were preferred by Gammarus pseudolimnaeus over untreated leaves (Barlocher and Kendrick 1975). Barlocher (1982) also showed that fungal exoen-zymes extracted from decomposing leaves remained active in the presence of gut enzymes of G. fossarum for up to 4 h at the foregut's pH, indicating that ingested exoenzymes can aid in the digestion of polysaccharides. Some shredders may be able to actively discriminate between fungi and leaf material. In feeding trials with the freshwater detritivores G. pulex and Asellus aquaticus, Graca et al. (1993) found that both species discriminated between fungal mycelia, fungally colonized, and uncolonized leaf material. 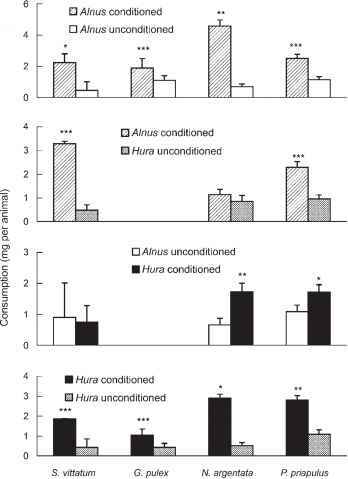 A. aquaticus selectively consumed fungal mycelia, whereas G. pulex fed preferentially on leaf material, and for the latter species fungi appeared to be more important as modifiers of leaf material. Experiments using radiotracers to separate the micro-bial versus substrate contributions to individual growth corroborate that the bulk of the energy is obtained from the leaf. Using radiolabelled food sources and inhibitors of DNA synthesis, Findlay et al. 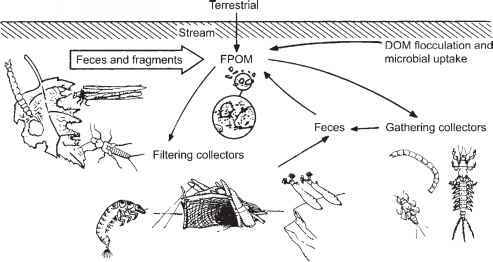 (1984, 1986c) demonstrated that only 15% of the respired C in the freshwater isopod Lir-ceus and 25% in the stonefly Peltoperla was met by consumption of microbes, primarily fungi. In addition, while insect larvae may lack the ability to synthesize cellulytic enzymes, Sinsabaugh et al. (1985) demonstrated using radiolabelled cellulose substrate that leaf-shredding insects indeed were able to digest and assimilate plant cell wall polysaccharides. Sinsabaugh et al. (1985) inferred that digestion was aided by ingested exoenzymes in the case of Pteronarcys, and by endosymbionts in the distinctive rectal lobe of the hindgut of Tipula. Leaf-shredding crustaceans produce enzymes that enhance their ability to digest leaf litter of terrestrial origin. The amphipod G. pulex produces phenol oxidase and cellulase activity in the hepatopancreas, whereas in the isopod A. aquaticus these enzymes are produced by endosymbiotic bacteria (Zimmer and Bartholme 2003). Algae and bacteria of biofilms associated with leaf litter may contribute substantially to shredder nutrition. The exclusion of leaf litter from experimental stream reaches forced greater reliance on biofilms, and the shredders Tallaperla and Tipula derived on average 32% and 14% of their C from bacteria, respectively, probably in the form of bacterial exopolymers (Hall and Meyer 1998). Shredders can also obtain C from algae growing on leaf biofilms, where the algae can increase the food quality of leaf biofilms and also stimulate microbial production by the release of exudates, and thereby enhance the growth of shredders (Franken et al. 2005). Fungi contribute the majority of microbial biomass associated with decaying leaves, however, and even in large rivers where bacteria might be expected to increase in importance relative to fungi, fungal biomass greatly exceeds bacterial biomass (Baldy et al. 1995). Section 3.2. Wood can contribute 15-50% of total litter fall in small, deciduous forest streams and even more in coniferous regions (Anderson and Sedell 1979). Wood is considered to be a minor energy resource because few invertebrates feed on it directly and wood appears to be a poor food. Although its importance diminishes downstream and it is utilized only very slowly (a residence time of at least years to decades, in comparison with weeks to months for leaves), wood provides food and habitat for a number of species. Anderson et al. (1978) found some 40 taxa associated with this resource in wood-rich Oregon streams. Prominent aquatic xylophages included a midge (Brilla) which was an early colonizer of phloem on newly fallen branches, two species that gouged the microbially conditioned surface of waterlogged wood (the elmid, Lara, and the caddis, Heteroplectron), and a crane fly (Lipso-thrix) that consumed nearly decomposed woody material. In comparison with leaves, invertebrate standing crop biomass on wood was about two orders of magnitude lower per kilogram of substrate. Lotic consumers are relatively unspecialized for xylophagy. The beetle Lara avara possesses robust mandibles capable of slicing away thin strips of wood, but apparently lacks digestive enzymes or gut symbionts to aid digestion. Microscopic inspection of material progressing through the gut indicated no change to the wood (Steedman and Anderson 1985); presumably the larva is nourished by microbiota and their exudates occurring on the wood surface. Not surprisingly, L. avara grows very slowly and requires 4-6 years to attain maturity. Wood fibers represented a high fraction (63%) of the gut contents of the caddis Pycnocentria funerea in streams draining a pine forest in New Zealand, and stable isotope analysis also indicated that most of its nourishment was derived from pine wood (Collier and Halliday 2000). In streams in agricultural settings in Michigan and Minnesota where wood was comparatively rare, the presence of wood increased faunal diversity (Johnson et al. 2003). From a trophic perspective wood may be important primarily as a resting and feeding platform (Dudley and Anderson 1982), and a site of biofilm development and thus a food source for scrapers (Hax and Golla-day 1993). Of the taxa found predominantly associated with wood in the study of Johnson et al. (2003), most were collectors, and predators were disproportionately common.